A new pool is a big investment, which is why you want to ensure you’re getting a pool that is specifically tailored to your wants and needs. There are plenty of standard pool designs, but why settle for something that’s been done before? 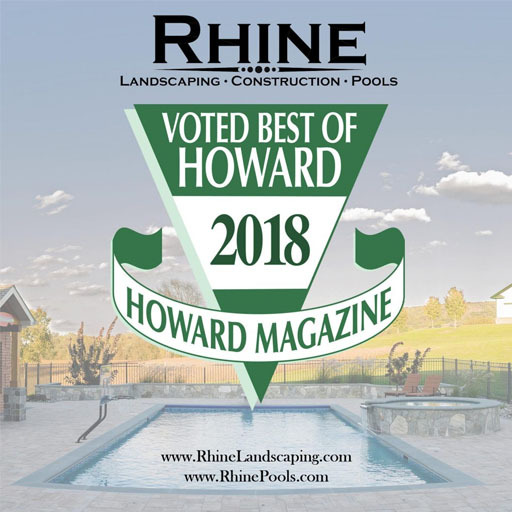 If you really want to make your pool stand out, consider custom pool design services from Rhine Pools. We know not just how to design your pool, but how to incorporate it into your outdoor living setup to create your own personal oasis right in your backyard. The pool is the centerpiece of your backyard. As such, you want it to shine. 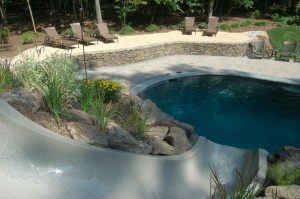 Custom pool design is more than just a catchphrase for us. We truly believe in making your pool one-of-a-kind. That’s why we work with you in the design phase to discuss your ideas on your pool. We’ll take a look at your current outdoor living situation and determine how to make the pool the focal point of your backyard. But we won’t stop there. Why? Because custom pool design is about more than just the pool. We believe your pool should be the most prominent feature of your outdoor living situation. We also believe that your pool needs to be seamlessly incorporated into your backyard in order to create the desired effect of your backyard as your own personal oasis. In order to do this, we place a big emphasis on the landscape around your pool. 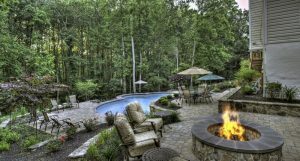 How can your yard be contoured to create a natural and realistic transition from the landscape to the pool? What’s the most aesthetically pleasing way to merge the elements of land and water in your yard? This is what custom pool design is really about. Once we’ve created a vision together for your pool and landscape, it’s time to consider additional features like hardscaping, structures, fencing, and lighting. Do you want a space outdoors to entertain guests? An open-air pool house can be incorporated into the design. Outdoor kitchens and bars bring the food and drink outside for cookouts with friends and family. Hardscaping and fencing create visually pleasing lines that give a new spatial dynamic to your backyard. Lighting adds the final touch for evening and late night fun. Our goal is to help you realize your vision not just for a custom pool design, but for a complete outdoor living solution. Your backyard can feel like your own personal oasis, and Rhine Pools can help you achieve this. Talk to us today for more information on our custom pool design services.